"When a woman smiles, then her dress should smile too." TIMELESS, BEAUTIFUL, BREATHTAKING, et cetera. Where can I get it? NEWSFLASH! It's couture! And it's 72 years old! Designed by legendary couturier, Madeleine Vionnet, this exquisite tulle, silk, halter dress will be part of the Parisian exhibit scheduled to debut in her name on June 18 at the Les Arts Décoratifs. Umm...Take me to Paris? S'il vous plaît??? Merci, beaucoup! 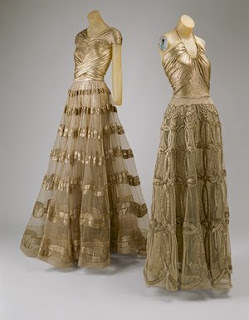 The private non-profit decorative art museum are currently preserving Vionnet pieces from 1912 through 1939! However, before the couture items can be shown, there is much work to be done. 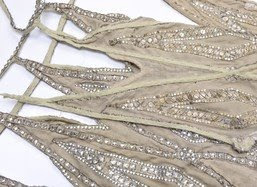 Many of her gowns were made with delicate materials such as tulle, silk crepe and muslin which creates a challenge for curators in terms of displaying the designs over a lengthy exhibition period. 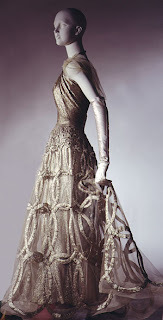 "These dresses, that were worn for one evening 70 to 90 years ago will be exhibited on mannequins for [eight] months. The [new linings] are attached in such a way that, if a piece cracks, it's the new bit that gives and not the original fabric." says Pamela Golbin, head curator of the exhibit. Eeeek! Don't crack! Madeleine Vionnet (June 22, 1876 - March 2,1975) is a French couturier hailed for being the "Queen of bias cut" when she introduced the charming shape to the world in the 1930s. Inspired by Grecian art, she used corsets and padding to accentuate the female form. 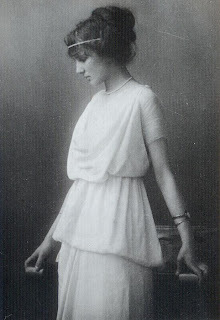 The structure of Vionnet's pieces were delicate and sweeping, often characterized by a cowl neck or halter style. Vionnet modernized women's fashion and many stars such as Katherine Hepburn and Marlene Dietrich were fans of the couture maven. Today, her presence in the fashion world is ubiquitous and top designers, John Galliano and Marchesa, have created contemporary collections reminiscent of Vionnet's elegant styles. Her couture label, The House of Vionnet, has since been acquired by the Marzotto Apparel, a Milan textile powerhouse. It's designs are currently spearheaded by Rodolfo Paglialung, who was previously a 13-year veteran womenswear designer at Prada.